You rush into the Purgatory room, Fuse behind you, the enormous Macland shoving his fist through the wall all around. You pause as you first step foot into Purgatory, again encountering the strange mind defense that Arvin Carpenter implemented in Macland's brain. Then Macland's huge fist breaks into the room. Fuse immediately lights... everything on fire, from the fist to the entity that only sort of exists. The defense mechanism was designed to counter a single telepathic intruder, and is poorly prepared to deal with so much happening at once. The entire representation of the mindscape begins to fall apart, at least in this room--but that includes the barrier between you and the exit. You and Fuse charge forward, reality splintering behind you as you rush out of Macland's mind. Everything is black for what feels like a few minutes. You wake up in one of the beds back at the motel room. It takes a moment for everything to come back into focus, to feel "real" again. You slowly realize that Fuse is still unconscious in the other bed. If this was an NBA game, that'd be a good thing, but here? Nope nope nope! We need to get Fuse to some water! Or roll him in the blankets to smother the flames, while finding water. And once he's done, we can check to see if Macland is still alive. We may have to do some mental Triage for him if possible, as we did cause him to almost kill himself. Disregarding life is not our quota, it may be Macland's but not ours. Quota? I think you meant modus operandi. a fixed share of something that a person or group is entitled to receive or is bound to contribute. Depends on how you read the definition I guess. smother him with a blanket! quick!! before the fire spreads! Also, what do you use to make these sprites? Photoshop. 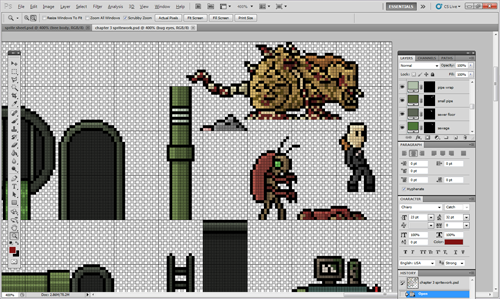 I make the grid visible with 32x32 boxes, and draw pixel by pixel with the selection tool set to very tiny. Use the blood level to hopefully calm his flames and then try to wake him up, while turning him into the biggest burnt blanket burrito ever. Painkillers Ahoy when he does wake. Smother him with blankets, of course! After the flame is out, check for burns, Hopefully, he was only burning up for a few seconds. Then find ice. Lots of ice. Low priority question: how is Macland doing? We should check to see how much brain he's lost to the Memes. Y'know, after we figure out how our actual friends are doing. Actually, ice is bad for burns, cause you can freeze the cells into more damage. Cool water, or cold water is best because it avoids causing the weakened cells from being broken by ice crystals forming inside the damaged cell liquids. Yeah, Baeronius has it right. After we get him extinguished though we should maybe run a cool (not too cold) bath and stick him in it. As we smother the fire out, please painkiller the crap out of the poor guy. My goodness MM, you really are putting Fuse through the wringer :'D though it seems that if we hadn't brought him in, we wouldn't have escaped, so there's that... but poor Fuse. POOR. FUSE. And survey how bad the burn damage is once it's out. Please don't be so bad. Please. ;_; Fuse deserves nicer things than this, poor kid. How much of a badass is Fuse, that he can light something nonexistent on fire? A lot of a badass, is what I'm saying. Step 1: Stop fire. With SCIENCE! (anything) Step 2: Attempt to discern where his mind is. Step 3: Ask Red if... its back and how to get Fuse back and also if Macmand died. Part of me wants to say 'pleeease let Macland have died', but then another part says we still need him.